An educational platform for information literacy; Designing process-oriented information literacy education: The library practitioner as a professional and autonomous educator; Facilitating the student’s research process: The academic librarian as a supervisor; Conclusions. From a traditional role of information gatekeepers, librarians have been challenged to become pedagogues who teach and counsel students in information literacy. The aim of this book is to professionalise the educational role of academic libraries. It helps information professionals design and carry out information literacy education programmes. 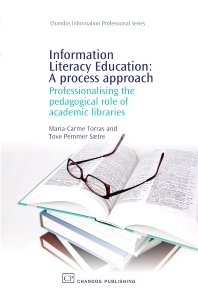 The book puts forward a process-oriented approach to information literacy user education. Practical ways are outlined in which librarians’ pedagogical involvement in higher education can be enhanced. By applying two general didactic models, the book meets the information professionals’ needs to make theoretically founded and independent choices in her teaching and supervisory practices as well as critically reflecting on them. Examples of best and less good practice are drawn upon to provide scenarios for reflection which can inspire and enrich the information professional’s work. Academic librarians other information professionals working with information literacy and LIS education. Dr Maria-Carme Torras Calvo is a senior academic librarian at the University of Bergen Library. She is the head of the library teaching board. She is a standing committee member of the IFLA Section for Information Literacy. Tove Pemmer Sætre is the library director at Bergen University College, Norway. She has published and lectured in pedagogy and librarianship internationally. She has been chair of the IFLA Section of School Libraries and Resource Centres 2003-2005.